Bayfront Beauty! VIEWS! VIEWS! VIEWS! Enjoy life at the beach in your own private, quiet, natural setting nestled in the dunes of the white sandy beaches of Cape May Beach. This home offers 5 bedrooms, 4 full bathrooms, hurricane proof construction and gorgeous finishes. It was lovingly crafted and completely redone in 2009 by Hand Builders, in collaboration with the sellers, to evoke maximum enjoyment while enjoying a maintenance free pleasure-only lifestyle. Enter the home from a pavered walkway into a foyer area finished in stylish white-weathered wood look tile flooring. There are two nice sized guest bedrooms with deep closets on this floor, one with two closets and sliders to a covered patio that leads to the beach. A sitting room for hanging out or having some quiet time is conveniently located on this floor as well. The bathroom is finished in decorator tile with a tub and glass shower door. Moving upstairs you will be awed and delighted by the magnificent bay view as you enter into the main living space. Gleaming hardwood flooring, soaring ceilings, a wall of windows and soft natural lighting immediately gives you that ahhhhh relaxed and contented feeling. The living room has custom built-in cabinetry and a gas fireplace to cozy up to on those blustery winter nights. Super solid construction keeps the home well-insulated and quiet. Sliders lead to an outdoor kitchen finished with granite countertops for enjoying BBQÃ¢â‚¬â„¢s with friends and family. The kitchen is finished in Decorator Whitewashed Cabinetry and complimented with a Navy center island, tile backsplash, Bosch and Whirlpool stainless appliances and granite countertops. Sit either at the dining room table or out on your screened in porch and enjoy the sights and sounds of the bay and soft summer breezes. The master bedroom is located on this floor. It has cathedral ceilings, sliders to a deck that takes you right to the beach, a spacious master closet and sophisticated bathroom with double sinks, custom cabinetry, glass shower doors and a Bidet style toilet. There is an additional guest bedroom on this level as well as a hall bath with designer finishes. The third floor has a lovely loft living area that opens to an enclosed Bayfront porch. There is a second master bedroom on this floor with a private sitting room and tastefully appointed full bathroom. The exterior of this home was designed to be maintenance free with vinyl rails, composite decking and a white pebbled yard area. Meander down to the beach, just steps from your home and feel your toes in the warm sand and the cool water. This location is so peaceful and soothing. Furnishings minus personal items may be included with the sale at a mutually agreed upon purchase price. Nothing to do but pack your bags and start living the dream! 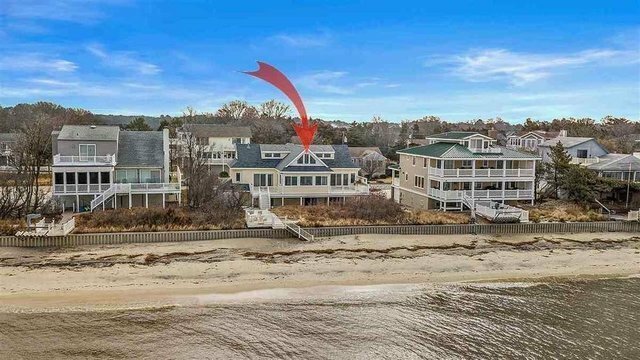 Extras include: Smart technology, Burglar alarm system, recessed lighting, cable in every room, 3-zone HVAC, sandbox for the little ones, sitting deck at the edge of the dune and private steps to the beach, Carolina beaded vinyl siding, only minutes to Cape May and so much more! *outdoor grill sold as-is currently not operable *Well water- Sellers opted to stay on the well water they have as it is very pure. However, they have paid the permitting fee to the Township and do pay the minimum required quarterly fee of $68. See associated docs for Expense Report and Sellers Disclosure. Easy to show.